I’m one of those rare people who actually enjoy eating their greens, especially when it comes to kale. Kale is from the Brassica oleracea family, just like cabbage and brussel sprouts. This hearty green vegetable is delicious, versatile, and like all leafy greens, highly nutritious! Kale is very high in vitamins A, C and E, and is also full of sulfer-containg phytonutrients which are thought to lessen the occurrence of a wide variety of cancers, including breast and ovarian cancers. Me? 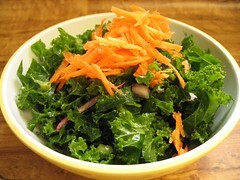 I love kale for its flavor and texture. There are several varieties of kale, including curly- and plain-leaved, but my favorite is is cavolo nero, also known as “black cabbage” or “Tuscan kale”. I’ve never seen it in US supermarkets but it’s popular here in London. 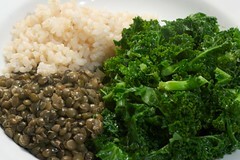 Last year, my favorite way to prepare kale was simple: lightly steamed with salt and pepper. When served with a bit of brown rice and lentils, you get a complete meal that is somehow comforting in its simplicity. At least I think so, anyway. I guess not everyone shares my enjoyment of pure and simple kale. Stir-fried garlic and kale never fails. Even better is kale stir-fried with caramelized onion. When all else fails, greenophobes can hide their kale in a big pot of soup or chili. 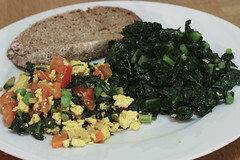 Kale also makes a great addition to tofu scrambles! One pairing I can definitely recommend is kale and carrots. 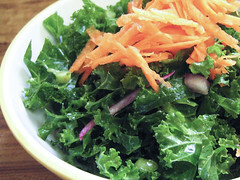 In both stir-fries and salads (yes, kale can be eaten raw! 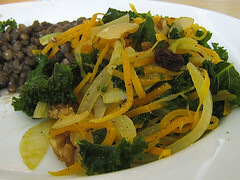 ), the sweetness of the carrot is a nice balance to the earthiness of the kale. 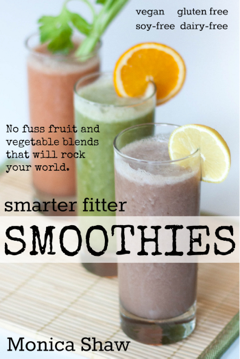 Here are a couple recipes that take advantage of this combination. Heat oil in a large pan. Add carrots, onions, raisins, walnuts and chili and saute until onions are soft. Add the kale, salt and a couple tablespoons of water. Cover pan with a lid. Check the kale after a couple of minutes. Add more water and cook longer if necessary. Combine all ingredients. Allow to marinate in the refrigerator for several hours before serving. I LOVE kale. I have a batch waiting for me in my garden and will likely be harvesting it in the next day or two (last harvest of the season). Unfortunately it is hard to find in the markets here in Quebec. Thanks for the recipes! Take a look at http://bitten.blogs.nytimes.com/2008/10/14/a-refrigerator-staple-cooked-greens/“ rel=”nofollow”>this entry in Mark Bittman’s blog. I like the idea of keeping cooked greens on hand in the fridge—partly because it simplifies the grocery unpacking: Greens? Okay, cook them now. I’ll have to give kale another chance–tasted bittter to me last time I tried it, but it might have been in the preparation. Kale is something rarely available here in Sydney – unless you manage to grab some at an organic farmers’ market. But I use silverbeet (chard?) a lot – for similar dishes to the above. The couple of times I have managed to get my mitts on cavalo nero I haven’t been able to go past ribollita. Lovely suggestions on how to use more greens.